​My name is Cristina. 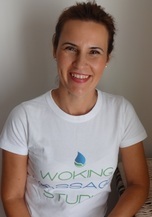 I worked in the City and Canary Wharf for 12 years before deciding to change my career path, and retrain to become a BTEC Level 5 qualified Massage Therapist. I endeavoured to take this exciting step after experiencing first-hand how beneficial massage can be to get rid of everyday working stress and muscular pain from bad posture. My studio is located in Oriental Road, 5 minutes walk from Woking train station. This is conveniently suited for travel from neighbouring Surrey locations such as Guildford, West Byfleet, Chobham and Weybridge. I am a graduate of the London School of Massage and St. Mary's University. I am also a member of the Complementary Therapists Association and fully insured. "Thanks for the massage. I had one of the best nights of sleep in a long time" Audrey M.
"Thanks for the massage this week. My shoulders feel great and at the moment I don't feel the usual strain on my back" Lynsey Rice.